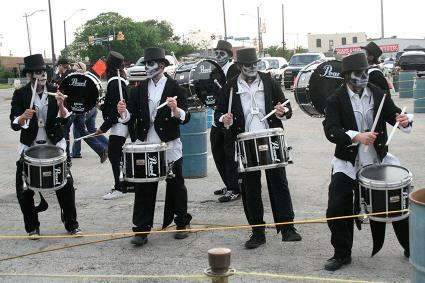 Serious haunted house fans are likely familiar with Cutting Edge Haunted House located in Fort Worth, Texas. The frightful attraction has been featured all over the media and holds two Guinness World Records for its massive size. Cutting Edge Haunted House is set in a 100-year-old abandoned meat packing plant, which definitely adds to the creepy effects. Once referred to as "Hell's Half Acre," the plant utilizes old meat packing equipment that dates back to the Old West, but now they process humans. Realistic mannequins are hoisted up to the second floor and taken through the entire meat packing process before landing back on the first level as butchered corpses. The layout changes each year, and it can take around an hour to get through the whole thing. Is Cutting Edge Really Haunted? Is this haunted house really haunted? The owners do believe there are some spirits that roam the old building, and that belief stems from the area's name of Hell's Half Acre. The name emerged in the 1800s when cowboys and famous gun slingers started hanging around the area searching for a place to unwind. They share an anecdote in Haunted House Magazine about a girl named Sally. She was very well-known with the gentlemen who frequented the area. She was found dead early one morning, nailed to an outhouse door near the gaming houses where she spent a lot of time. Some believe that her spirit still roams the area where she was brutally murdered and left on display. And, she's only one of the people who met untimely fates in the area. The old meat packing plant was not immune to several tragedies, and visitors today claim to catch a shadow out of the corner of their eye, and hear whispers, echoes, footsteps and voices when there is absolutely no one else in the building. Cutting Edge Haunted House is only open for the Halloween season. It typically is open select days and times in September and October. Tickets have usually been about $30, and the house is typically open from 8 p.m. to 10 p.m. on weekdays, and 7 p.m. to 1 a.m. on Fridays and Saturdays. 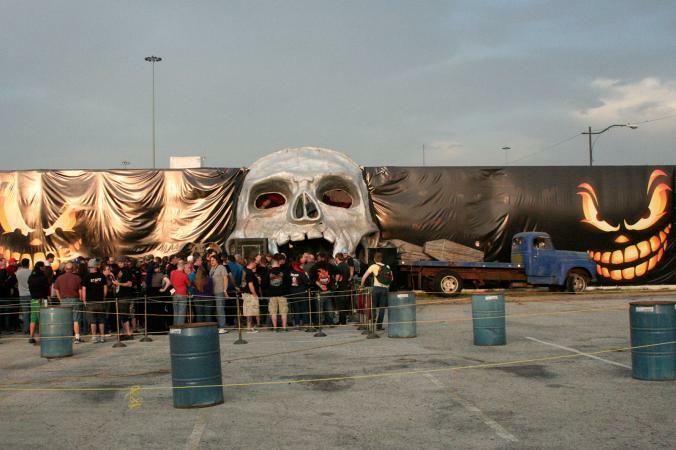 Cutting Edge Haunted House is open rain or shine, so no refunds are offered in bad weather. If you buy tickets at the door, it's cash only. You can use credit cards online when tickets become available for the next season. Parking lots near the haunted house range from $10 to $15. Group tickets are also available, but online only, so if you're coming with a group of 15 or more, make sure you look at tickets online for potential discounts. There is a link for a discount coupon (amount to be determined) that you can request by email. Not surprisingly, there is a serious warning that all guests must read before entering the haunted house. There are a lot of special effects, sudden actions, extremely low visibility, fog, moving floors, electrical shocks, intense audio, and wet conditions. You should not enter if you suffer from asthma, heart conditions, physical ailments, respiratory problems, mental illness, claustrophobia or other medical conditions. The attraction is not suitable for guests who have a pacemaker, are prone to seizures or are pregnant either. You cannot smoke, run, eat, or drink inside the attraction. Don't touch the actors, other customers, or any props inside. Video are flash photography are not allowed either. These are serious constraints, and they reserve the right to deny admittance to anyone who refuses to follow the rules or has a health problem that could cause injury to themselves or others. Cutting Edge Haunted House has been featured in countless media outlets, including haunted house and Halloween magazines. NBC Dallas Fort Worth has a great piece that gives insight into what goes on behind the scenes, including what employees call a "Scare Out Count," which is the total number of people who get scared so bad they have to leave early. It is considered a win for employees to terrify guests so badly they want to exit immediately. In other words, this is definitely not your average haunted house, or one you want to visit if you are easily terrified. Cutting Edge Haunted House has been featured in countless "top" rating lists of the best haunted houses. 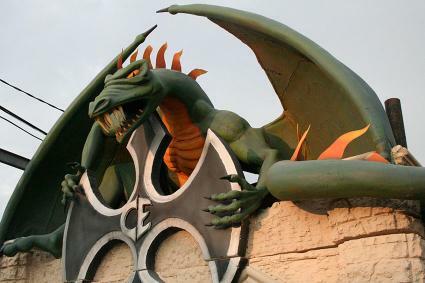 Yahoo ranks it as one of the most terrifying haunted houses in America and America's Best Haunted House Directory ranks Cutting Edge as third on its list of America's top haunted houses. In 2009, the Guinness World Book of Records awarded Cutting Edge Haunted House the world record for "Longest Walk Through Haunted House." They were also awarded World's Largest Haunted Attraction in 2015. Unfortunately, at least for the 2017 season, Yelp users were pretty disappointed with the design. There were complaints about a variety of issues, most notably about the value for the price of admission. For 2017, tickets were $35, and when you add in $15 parking, it becomes an expensive hour out. Several reviewers complained that the groups were not spaced out, and that it was too dark to appreciate the effects. Also, several reviewers noted that a portion of the 50 minutes' walk through the attraction were black hallways, stairs, and two pit stops midway along. Some did like the foam tunnel at the end, but warned to keep your mouth closed so you don't breathe in the foam. Others liked it, but complained about being wet and cold after. Seeing as they are only open a few hours each night, it's not entirely surprising to see one of the biggest complaints is about the long line. To avoid the lines, it might be better to either arrive immediately when they open or wait until closer to the closing time. The website does note that there is a cut-off time for people getting in line for the attraction prior to the closing time. Be cautious, as one user said they arrived 10 minutes before the cut off noted online, and they turned her away saying it was already closed. Reviewers on Cutting Edge's website are more favorable for the 2017 season. There are the same complaints about the groups being put together makes it less scary, but overall, most guests found it terrifying and said they enjoy it year after year. If you like haunted houses and either live in or are visiting the Dallas Fort Worth area, it might be worth checking out Cutting Edge Haunted House when it's open for the season. To help keep the disappointments down, be sure to bring money if you're purchasing tickets at the door. There is an ATM, but the line is long and there are fees. Also, some people talk about the wet sections leaving them cold, so plan to bring a change of clothes if you have plans later that night. Remember that the layout changes each year, so the 2018 attraction may be entirely different. It's best to judge for yourself rather than rely entirely of reviews from years past.